Heartbreaking, drunken, and lavish, Lady Crawford is a powerful second collection from one of Canada's finest poets. Chronicled in a series of metamorphic poems, Julie Cameron Gray reports from a world filled with parties and art before revealing the cost of an identity shed, as so many married women before her. Between imperial dinners and managing investments, Lady Crawford offers a rare glimpse of the inner-life of a woman who has married into a royal lineage. Julie Cameron Gray is originally from Sudbury, Ontario. She is the author of Tangle (Tightrope Books, 2013), and has previously published in The Fiddlehead, Prairie Fire, Carousel, and in Best Canadian Poetry 2011(Tightrope Books, 2011), and her second book of poetry, Lady Crawford, was released by Palimpsest Press September 16, 2016. 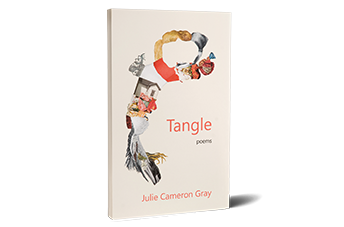 Teetering on the brink of longing and the downtrodden, Julie Cameron Gray’s poetic debut explores isolation and the distance between human understanding and human experience.